In an amazing twist of events, the looks that went down the red carpet for the 58th annual Grammy’s was a bit more on the conservative side. Never the less there were some breathtaking gowns for all shapes and sizes. I have to admit that I was truly impressed on how fashion house Givenchy created such an amazing gown for Adele and Designer Michael Costello created a beautiful mermaid gown for Jazmine Sulliven. [L to R] Adele + Jazmine Sullivan. But the red carpet was home to the glamorous, adventurous and the unconventional; Skylar Grey in Cary Santiago, Ellie Goulding in Stella McCartney, Tori Kelly in Gauri and Nainika, Kaley Cuoco in Naéem Khan and Zendaya in Dsquared2. [L to R] Skylar Grey, Ellie Goulding, Tori Kelly, Kaley Cuoco & Zendaya. 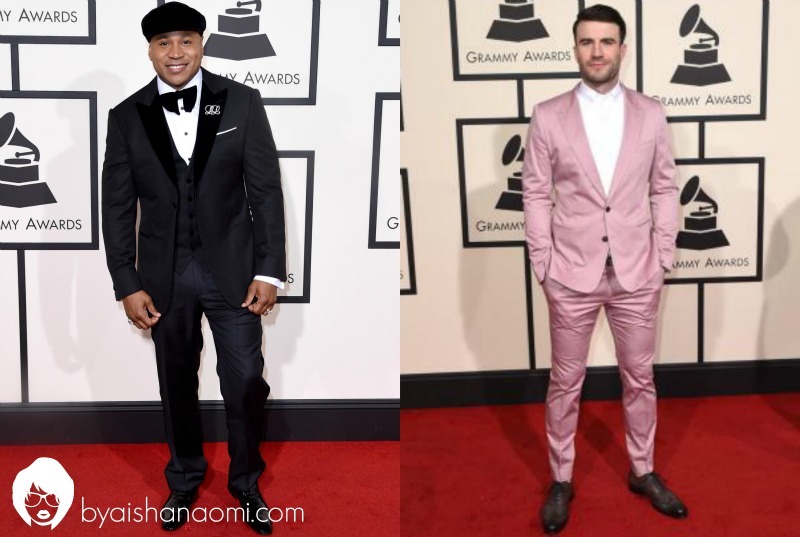 The men were a bit on the casual side, but the ones that took to the dapper approach to the red carpet were LL Cool J in Giorgio Armani and Sam Hunt in Dolce and Gabbana. [L to R] LL Cool J and Sam Hunt. Last but not least, I was totally taken aback with an astonishing David Bowie (one of my favorite musicians and fashion icons) tribute done by Lady Gaga. Her recognition to Ziggy Stardust was amazing and her outfit by Marc Jacobs, to die for. For more on the performance click on the following link: Lady Gaga’s accolade to David Bowie at the 58th Annual Grammy’s. Lady Gaga in Marc Jacobs.